One of the high points of the day is a spectacular candlelight procession along Gratiot and into the cemetery to the Lourdes Shrine after the 7 p.m. Mass. As in Lourdes, France, the faithful processing will be singing hymns to the Blessed Mother and many religious groups will be present carrying banners and flags representing their affiliations. A beautiful statue of Our Lady of Lourdes held high aloft on a special platform carried by men of the parish will lead the long procession of priests, religious and the faithful to the miraculous Detroit shrine. The schedule of events for the August 15th celebration also includes Masses at 6:30 a.m., 9:30 a.m., and Noon. A healing service with the blessing of the sick will take place at 3 p.m. in the shrine. There is safe and secure parking at Assumption Grotto Church, and special attention will be given to the sick and handicap. A shuttle bus will also be available throughout the day and evening for additional parking at St. Veronica’s Catholic Church in Eastpointe. 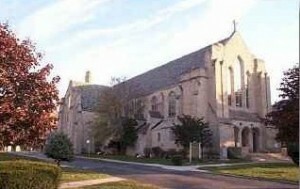 St. Veronica’s is located just 2 miles North of Assumption Grotto and one block East of Gratiot Avenue on Toepfer Drive. Other activities include the blessing of Miraculous Medals and of herbs. Exposition of the Blessed Sacrament, recitation of the rosary, praying the Stations of the Cross and confessions will be taking place at 11 a.m., 1:30 p.m. and 3:45 p.m. There will be a consecration to the Blessed Virgin Mary at 5 p.m. followed by a professional organ recital until 6 p.m.
A pasta dinner will be available for purchase between 11 a.m. and 5:30 p.m., as well as hot dogs, hamburgers, chips, pop, water and ice cream throughout the day. Vendors will also be offering religious items for sale including candles for the evening procession. The staff of Opus Bono will be part of the volunteers at Assumption Grotto all day on Wednesday, August 15th. For more information visit the website or call the rectory at (313) 371-0762. Assumption Grotto Catholic Church is at 13770 Gratiot Avenue, Detroit, Michigan 48205. Joe Maher is the founder of Opus Bono Sacerdotii with two other businessmen and a Catholic priest in Detroit, Michigan. He works directly with thousands of priests who have contacted Opus Bono Sacerdotii for assistance. Prior to founding Opus Bono Sacerdotii Mr. Maher, was responsible for the founding and senior level management of a variety of companies including financial firms, multimedia and entertainment companies and career outplacement services. Mr. Maher works daily to assist the Roman Catholic priesthood and raise his family with his wife of 20 years.